If you’re looking for a creative, useful and easy Valentine gift that isn’t overloaded with sugar, then I’ve got just the thing for you! 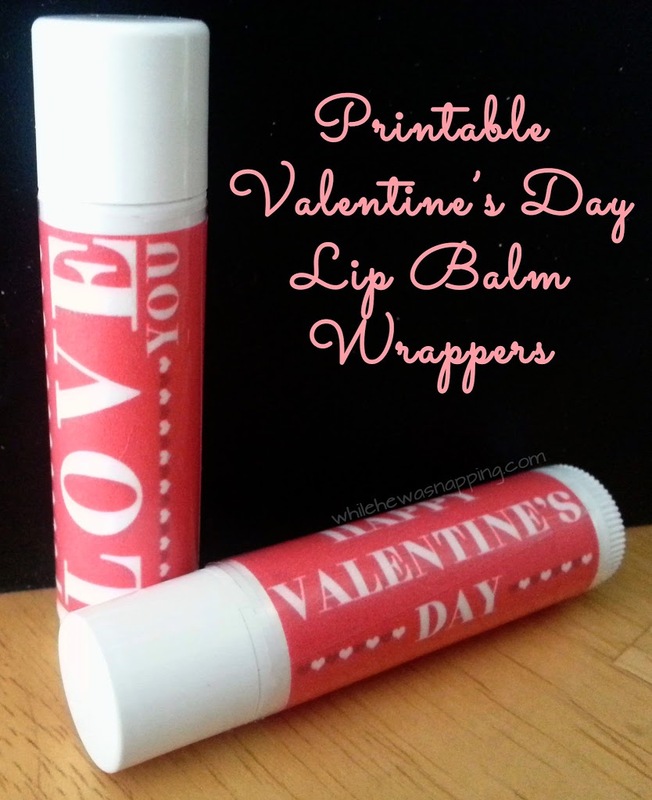 These printable Valentine lip balm wrappers are the perfect way to dress up a little gift everyone will love – because, who doesn’t use lip balm? In 2012, I tried making my own lip balm. I did some research, bought my ingredients and it wasn’t long before I was totally hooked. I haven’t bought a single tube of lip balm since. But whether you make your own or use your favorite brand from the store, these cute wrappers are a super easy and fun way to give a little valentine that doesn’t come with a sugar crash. And is actually useful too! 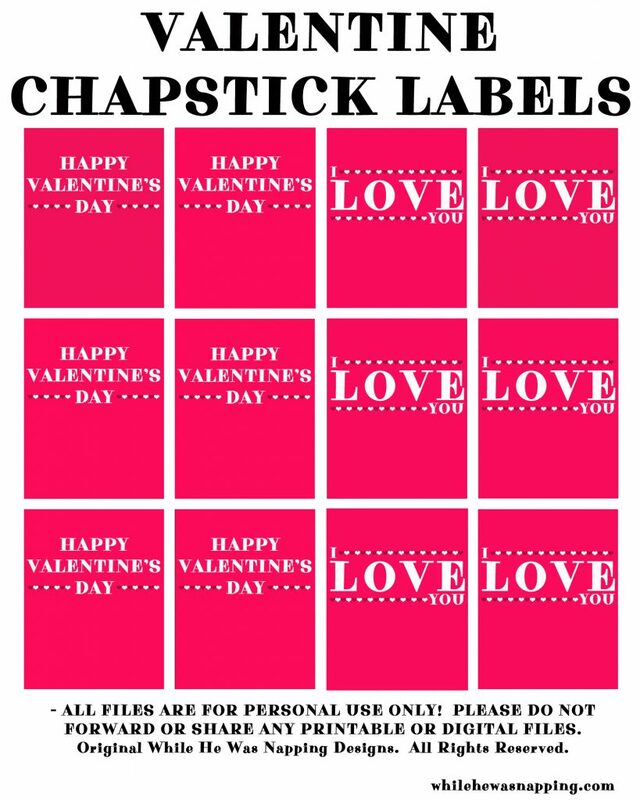 While I’d love to send you all a tube of lip balm with fun wrappers, I don’t have the hand muscles to write out that many address labels, so how about some printable labels instead? You can make your own lip balms (my favorite recipe is below) or just wrap the labels around your favorite tubes you get at the store. Just save, print, cut out and wrap. In 4 easy steps you’ll have Valentines you actually want and that won’t add to your waistline. Or your kids’ hyperactivity… You’re welcome. Here’s my disclaimer on making your own lip balm: When you first decide to take this on, there is a bit of an investment. This is a great project to split with some friends if cost is an issue. The shelf life of every ingredient is long enough that you won’t have to buy again for quite a while, depending on how much you make. Disinfect and sanitize your lip balm tubes. You can boil them in water for 1-2 minutes or run them through a sanitize cycle in the dishwasher. Just make sure they are good and dry before you try to fill them. Measure out a 2 part wax and 1 part oil ratio into your glass measuring cup. I typically use approximately 3 Tbsp of wax and 1 to 1.5 Tbsp of oil. * Note: If you’re thinking, “Uhm, lady that’s bad math! That’s not a 2:1 ratio!” you’re right, it’s not. My husband carries his lip balm in his pants pocket and he likes it a little firmer so it doesn’t melt and get squishy from his body heat. I do more of a 3:1 ratio for him. That’s why there’s a little math discrepancy there. You’ll have to play with the ratios a little to figure out what you prefer. Carefully place the glass measuring cup in the small pot. Fill the small pot about 3/4 of the way full with water, being careful not to get any water in your glass measuring cup. If you get water in the measuring cup, your lip balm may not set up correctly. Place the pot, with the measuring cup in the water, on the stove over medium heat. You want the water to come to a rolling boil, but nothing so rapid as to overturn your measuring cup. Melt the wax completely and use a transfer pipette to mix the oil and melted wax together. Add 1-3 drops of liquid vitamin E oil for extra moisture and protection. The vitamin E even offers a little SPF protection which makes it perfect for wearing outdoors. Using the pipette, mix the melted wax and oils. Stand your sanitized lip balm tubes up on a steady surface near the pot. Use the pipette to transfer melted wax into the tubes. Add as much wax as you can before it overflows, as the lip balm will compress and shrink as it cools down. Some times this is just a little trial and error. If you over flow a tube, just move to the next one and you can clean up any spillage after the lip balm cools with a paper towel. After the lip balm has cooled, place the lids on the tubes and snap into place. Use a paper towel to wipe up any lip balm that has gotten on the outside of the tubes or your work surface. I store my lip balm tubes in the fridge to extend longevity, but jojoba and vitamin E typically have 1-2 year shelf life, minimum. Check the expiration dates on your oils because sometimes they sit in a warehouse before you ever get them. You’ll know the oils have gone bad if they start to smell rancid. I’ve never made a batch with these ingredients and had them go bad. We use them too fast and I make 20-40 tubes at a time. This usually lasts us about 6 months or so. I have used other oils and had my lip balm go rancid. If you use other oils, you’ll need to check their expected shelf life and expiration dates. Once your tubes are cooled and cleaned you’re ready to apply some fun labels. 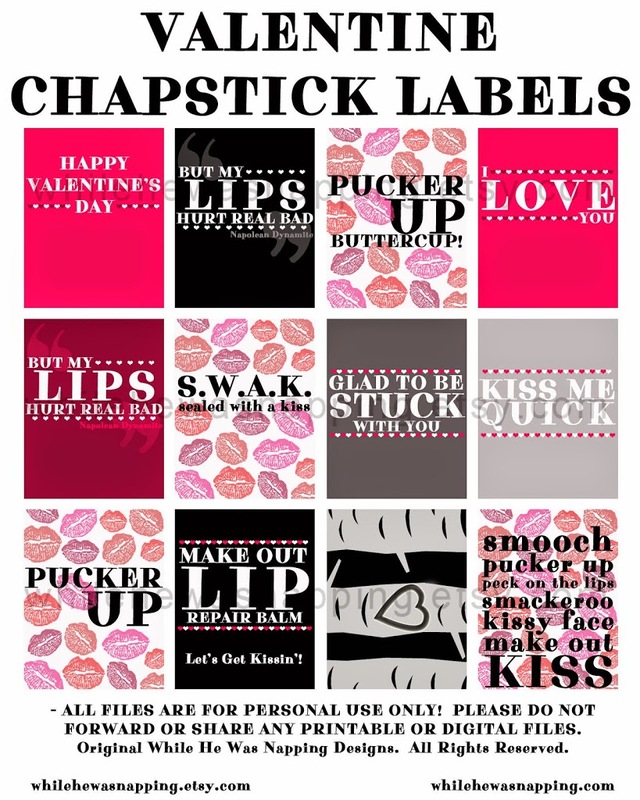 DOWNLOAD YOUR VALENTINE LIP BALM WRAPPERS! Print the labels on your printer paper or sticker paper. If you use sticker paper, make sure you’re printing on the label side of the paper, not the backing. This will depend on your printer and you may need to do a test print of the labels to check it. Cut out the labels with the scissors or paper cutter. If you want to write a personalized message on the wrapper, do it now – before you put it on the tube. Your kids can still address their class valentines if they want with this method. Stick the wrapper labels to the lip balm tubes with the glue stick or packing tape if you used regular printer paper. If you used sticker paper, remove the backing and stick the labels to the chapstick tubes. Note: I still recommend covering the labels with packing tape, even if you print on sticker paper because it gives the label a little extra protection. If you print with an inkjet printer, the ink will still run and fade if you drop the tube in the tub or send it through the laundry, but little water drops and splashes won’t hurt it. If you print with a laser printer, the tape helps keep the label from rubbing off. * Disclaimer: Due to different monitor and printer settings, I can’t guarantee color matching. 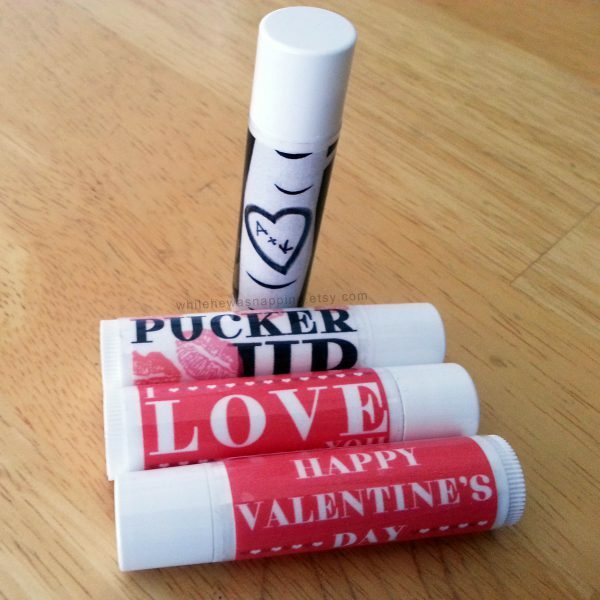 WANT MORE VALENTINE LIP BALM WRAPPER DESIGNS? If you’d like 10 more designs that are a little more grown up, you can get the whole collection in my Etsy Shop, including one you can personalize after you print it. Just use a pen or marker to write your favorite initials on the tree trunk wrapper. I love this idea!!!! Thanks for the printable!